My family has been vacationing in the land of the mango sunsets my entire life. To me, the islands of Sanibel and Captiva are a true second home. There is a reason why artists such as Robert Rauschenberg have called the islands home- these subtropical barrier islands are gorgeous and the people are easy going and funky. Beautiful at all times of the year, I enjoy being on the islands most in the winter. It is less crowded, still fairly warm and a sense of calm pervades the area. Go to Captiva and watch the gorgeous sunset. Grab a drink at The Mucky Duck and gather with other admirers on the beach. Local lore has it that at the exact moment the sun dips below the horizon a bright green flash will appear. I have yet to see this but fully believe it to be true. Do let me know if you see the flash! Finish the night with a giant piece of cake from the oh so funky Bubble Room- they are giant and delicious. J. N. Ding Darling. Rent a bicycle and ride through this beautiful nature preserve, which is a part of the largest undeveloped mangrove forest in the country. Or, if you are a bit more adventurous, rent a kayak and float through the mangrove forest and out into the bay. 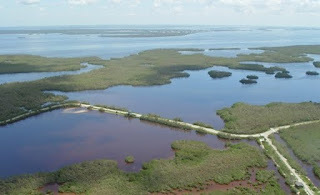 You will see abundant wildlife such as snowy egrets, tree crabs, rosy spoonbills and dolphins. Eat at The Lazy Flamingo and Gramma Dot's. The Lazy Flamingo is a true south Florida dive and is fantastic! Be sure to try the conch chowder and steamer pot, yum! Gramma Dots is a charming restaurant located on Yachtsman Drive in the marina. Get a glass of lemonade and watch the boats go by- I suggest the soft shell crab sandwich and coconut shrimp. Hire a boat and captain or be your own captain, either way exploring the nearby by islands of Useppa, North Captiva and Cayo Costa are a must. All three are only accessible by boat and are uniquely different. For some of the best shelling in Florida, go to Cayo Costa. 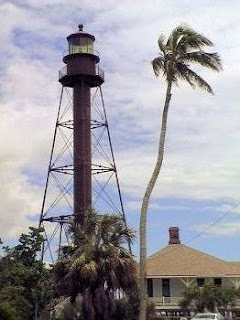 Visit the Sanibel Lighthouse, built in 1884 and the area surrounding declared a National Wildlife Preserve in 1950. Also, be sure to visit Bailey's Shell Museum for an interesting look back at the island's history. Would you like my suggestions for places to stay on the island? Please just email me at theconsummatehostess@gmail.com and I will be happy to help! 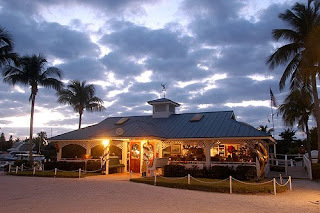 This entry was posted on 6:15 AM and is filed under Captiva Island , Gramma Dots , Sanibel Island , The Mucky Duck . You can follow any responses to this entry through the RSS 2.0 feed. You can leave a response, or trackback from your own site. I loooove the Mucky Duck and The Bubble Room! I have wonderful memories going there when I was a kid with my family and cousins! I love Sanibel and Captiva- been there several times!! I also love The Bubble Room in Captiva; it's so unique. 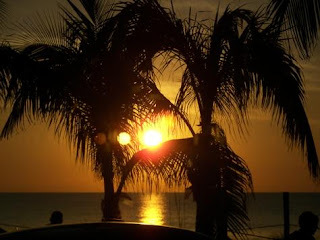 The sunsets are amazing- memories! Love love love this area of Florida. I have been to Sanibel and Captiva many years ago, but these days my family spends more time in nearby Boca Grande. It's such a gorgeous part of Florida- very different from the east cost where I grew up! how lucky you are to enjoy such gorgeous islands! 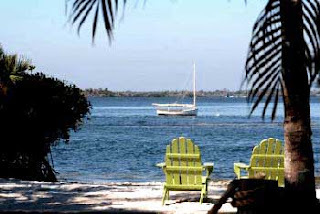 I have always wanted to visit Sanibel Island and it is on my list of places to go. Thanks for the beautiful images! I loveeeee Sanibel and Captiva. I went 10 or so years ago and we went somewhere that had "Nascrab" crab racing. Do they still have it? Looks lovely! All of the pictures are gorgeous and I especially love the lighthouse! oh dear GOODNESS how i need a vacation there! My SPF45 is slathered on, my sun hat is packed & my appetite is in check - all for a trip to your lovely Sanibel and Captiva. Thank you for the tour, definitely a place to visit. How wonderful to summer there as a child?! You're writing about my neck of the woods! These are some great recommendations for tourists--fantastic post! Want to go there now. Alright, you've convinced me, I'm going immediately! Hi Caroline! Nascrab, that is hilarious! I know that Tween Waters Inn on Captiva has hermit crab races, maybe that is what you saw. They have weekly races, I believe on every Tuesday night. I have a mucky duck tee and I love the island! Hi Highglossblue! Yes, they still have those fabulous drinks. It is almost like The Mucky Duck and The Bubble Room are stuck in a time warp, I swear they have not changed from when I was a little girl. Hope that you have a great day! Sanibel/Captiva is where I will retire. I have such wonderful memories of the whole Island. I want to have a place where my kids can come visit their old folks and bring their kids to enjoy the wonder of the Island.